According to me, KishoreDa is a shining star in the sky. He was a great personality and was very humble even after attaining heights of glory. He didn’t even hesitate to admire other singers. I am attracted by the feelings given by his songs. No other singer can match him. Kishoreda is Kishoreda,there will never be another great person like him.He is my guru.He mastered everything,what an incredible talent!!! We can’t really believe that guru is no more.His songs can be heard everywhere,in tv,radio,roads and where not? ?Sa ra ga ma conducted a search and found out that his songs are best seller.Also a great actor,music director,director,lyricist. KISHORE KUMAR IS PARAM PITA PARAMESWAR. I HAVE DEDICATED MY ENTIRE LIFE TO WORLD’S GREATEST GENIUS KISHORE KUMAR. Debjyoti entire life kardi hai? kya aap subhe se prog chal raha hai sun rahe ho? Kishore Kumar the name and the person himself gifted with supernatural divine voice and hearthrobing personality.Its really unbelievable that 20 years have swiftly passed off since his shocking death.Still cant get out of that trauma that he is no more.He will be always immortal in our hearts. singer and a great personality who is born just only once. Kishore Kumar, where could i find the words to praise you, being a director and actor too, you engraved the emotions into the songs, no one, simply no one, is like you. 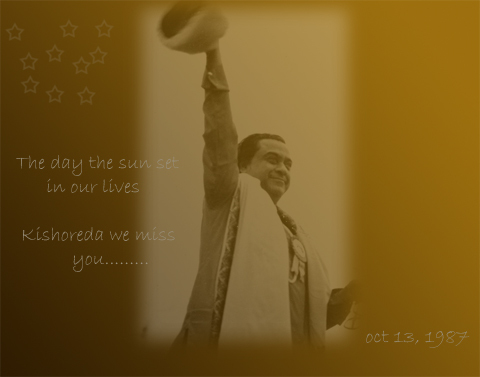 kishore da we miss u lot. main jab bhi koi achha geet sunta hoon, to main sochta hoon, kaas ye geet kishoreda ne gaya hota. kishoreda ke yelaba main aur kisi ka geet nehin soon ta hoon. balki mujhe achha hi nehin lagta hai. unki jeisa singer aj tak koi tha, na koi hai our na koi ayage. Kishoreda you made us musical orphans, it is impossible for us to foget you, forget the past and move on to the new trashy songs and singers, we look like fools stuck in the past but so be it, that is what you magic has done to us, at least we know what quality and god gifted means, everday I find new magic in you old songs and wonder how could you possibly do it with such ease where so many have stuggled for so many years, only when we begin to understand Einstein do we understand you just a little more. Love you forever, thanks for the songs they live in our hearts forever. KISHOREDA IS THE ONLY KING OF MELODY WHO HAD SUPER NATURAL TALENT WHO PROVED THE WORLD THAT HE IS THE ONLY ONE WHO COULD DO PERFECT YODELLING AND CAPABLE OF SINGING ANY TYPE OF SONG. SINGERS ACCROSS THE WORLD TRIED HIS YODELLING, EVERYONE FAILED, NO ONE EVEN COME CLOSE. NO ONE CAN EVER DISCOVER HOW HE MANAGED TO SUCH A UNIQUE TYPE OF YODELLING AND THE MYSTRY REMAINED UNSOLVED. KISHOREDA WAS THE ONLY KING OF MELODY WHO HAD SUPER NATURAL TALENT AND SKILLS HAS PROVED THE ENTIRE WORLD THAT HE WAS THE ONLY ONE WHO COULD DO PERFECT YODELLING AND CAPABLE OF SINGING ANY TYPE OF SONG PROVIDED. SINGERS ACCROSS THE WORLD TRIED HIS YODELLING BUT ALL THEM FAILED, NO ONE EVER COULD COME CLOSE AS HIS SINGING STYLE REMAINS UNDEFEATED. WHEN EVER I LISTEN TO HIS BEAUTIFUL SONGS I BECOME ROMANTIC AND STRESSFREE. I NORMALLY WONDER THAT HOW COME HE COULD SING SO PERFECTLY WITHOUT STUDYING MUSIC, THOUGH HIS SINGING STYLE WAS TOTALLY DIFFERENT FROM OTHER SINGERS. HIS YODELLING AND AN INCREDIBLE LAUGH IN MOST OF HIS SONGS HAS PROVED HIM THE BEST OF ALL. I BELIEVE IN FUTURE THE ONLY PERSON WHO COULD EVER YODELL AND SING JUST LIKE HIM MUST BE TOTALLY BLESSED. NO DOUGHT KISHOREDA WAS FULLY BLESSED AND OF COURSE GOD GIFTED THATS WHY HIS SINGING AND YODELLING WAS UNIQUE AS NO ONE COULD EVER POSIBLY DO THAT. PEOPLE KNOWS THAT HE WAS TOO GOOD BUT NO ONE ADMITS IT. KISHOREDA, IAM SAYING YOU WERE THE BEST OF THE BEST AND YOUR EVERGREEN HITS TOUCHED EVERYONES HEART. ULTIMATELY I WOULD PRAY TO LORD JESUS FOR HIS BLESSINGS ON KISHOREDAS SOUL AND REQUESTING HIM TO SEND KISHOREDA BACK AGAIN ON THIS EARTH WITH FULL OF MELODIES WHO COULD ONCE AGAIN PROVIDE US PIECE OF MIND, JOY AND HAPPINESS. We all admire Kishoreda to no limits, as he was one among the precious jewels that our country has produced. Untiring to the last day, Kishoreda provided some of the best musical compositions and ranks among the very top of all-time best singers and musicians. Very innovative and quick to grasp the need of the song, Kishoreda would render the compositions in a very unique style, that he alone could produce. long live kishoreda. If any of kishoreda’s fans can provide me with the following (1) ji bhar ke dekh lun mein tumhe, zulfe idhar kar lo, sara jahan hai udhar tum nazar idhar kar lo (film not known to me) and (2) khija ke phool pe aati kabhi bahar nahi, mere naseeb mein aye dost, tera pyar nahin (do raaste, I presume) I shall be highly obliged. my email id asmurty2@rediffmail.com thanks.